Pakistani Imam Khalid Chishti has been remanded in custody, accused of planting pages of the Koran among burnt pages in the bag of a Christian girl held for blasphemy. Prosecutors say Imam Khalid Chishti will himself face charges of blasphemy. Imam Khalid Chishti allegedly told a witness, after tampering with the girl’s bag, that this was a “way of getting rid of Christians”, a prosecutor said. Rimsha’s parents have been taken into protective custody following threats, and many other Christian families have fled the neighborhood. Pakistan’s strict blasphemy laws are often used to settle personal vendettas, correspondents say. Last year two leading politicians were assassinated after speaking out against the legislation. 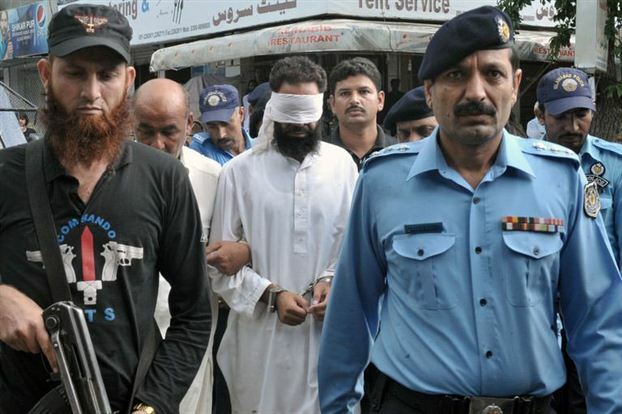 Imam Khalid Chishti appeared in the Islamabad court with a white blindfold and shackled hands. There was a large police presence as he was ushered into the building. “The imam was arrested after his deputy Maulvi Zubair and two others told a magistrate he added pages from the Koran to the burnt pages brought to him by a witness,” an investigator Munir Hussain Jaffri said. He said Maulvi Zubair and some others had told the imam not to interfere, urging him to “give the evidence to the police as he got it”. The investigator said the cleric had been arrested at his home on Saturday under Pakistan’s blasphemy law. The girl’s lawyer told AFP news agency that Rimsha “should be acquitted immediately”, as it had been “fully proven that it was a conspiracy”.